S3M.IN is built just for tech savvy people like you. S3M.IN assists mobile users and as well as PC users to send their photos, videos and documents on their mobile phones to any other person’s mobile phone. So that you do not have to connect your mobile phone to PC every time you wish to send a photo to your friends and family. In the first text box, you provide your mobile number. 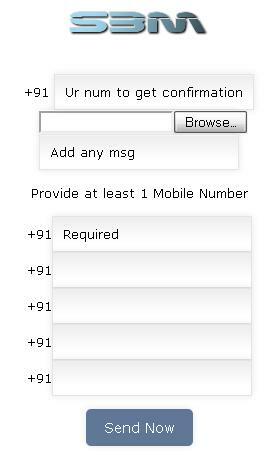 This is so that S3M.in can send you the confirmation SMS. Use Browse button to browse your mobile phone to select any file. It might be a photo or a video or an audio file which has captured your emotions and feelings. These feelings can now be shared through pictures and videos. Now, personalise your message. This is just like an SMS with a limitation of 160 characters. Pour your words out which act like a caption to your uploaded file. Now, in the provided text fields, provide the mobile numbers of your friends and family with whom you wish to share the file. Provide at least one number to test, use and have fun. Now, comes the hardest part. Click the ‘Send Now’ button and watch the magic happen. Your files are ready to be shared with your friends and even on social networks like FaceBook, Twitter, StumbleUpon. Use and provide your comments or suggestions in the comment box below.